A bad restaurant selection or hotel stay is rarely catastrophic. The stakes for enterprise technology decisions are much higher. Therefore, ensuring that a person writing a review is a legitimate technology buyer/user and not a vendor reviewing its own products is critical. This led us to build a two-step authentication framework using email and LinkedIn to validate a TrustRadius user’s identity, and to block companies from reviewing their own products and those of their competition. Furthermore, all reviews are staged for review by our team before going live. Several people we interviewed said that they were not candid in public forums like LinkedIn and listservs as they did not want their feedback about vendors to be personally attributable to them. Complete anonymity is not the right answer however, as people want to know whether they can trust a reviewer's perspective. Sharing a person’s level, function, industry etc. can help establish trustworthiness, even when their name and company are not disclosed. Many interviewees expressed a desire to disclosed their real identity with a finite network of people they trust, so as to enhance their social capital with this group, but hide it from others. These findings led us to build an identity management framework where you can set your identity as private, semi-private or public. In private mode, your name and company are not shown, but your role level, industry, company size are displayed. In semi-private mode, you can select who can see your real identity, including people who work at the same company, and a subset of people within your LinkedIn network. Enabling reputation development is important to bolster confidence in a peer network. On eBay, the selling party is rated based upon the experiences of others buying from them. Similarly, we believe that a trust-based information sharing network should also allow people to establish reputation based upon their contributions and community feedback. In TrustRadius, your reputation grows as you post more content, and as community members give positive feedback. 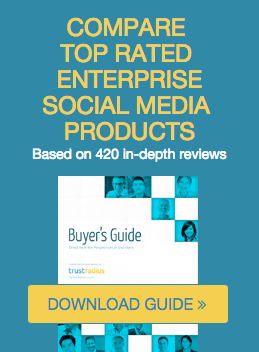 For enterprise technology, we believe 5 informed reviews are more valuable than 1000 data points. Enterprise technology decisions have high stakes and are complex. Rarely are such decisions merely “yes/no” decisions. Buyers face multiple considerations, e.g. which edition to select, which modules should I buy today, should I opt for premium support, how should I deploy, how will I integrate, how many staff will I need, how do I drive adoption, what should I negotiate, what internal expectations do I need to set, etc. As such, we believe that the depth of insight trumps the number of reviews. There is value in statistically verifying a trait like usability or customer service, but more value is found in the qualitative comments of ones peers. Most consumer review sites give reviewers a “blank canvass” to write whatever they want. This leads to a great deal of variability in both the format and the quality of reviews. It leads to a user experience which requires trawling through multiple reviews to get to the right information. In a business context, we feel it is important to impose structure. We believe business users want to be able to quickly find the data they are looking for easily through key word search, and through familiarity with a standardized review format. We are using a structured online interview approach, guiding people through a series of questions – typically numeric and qualitative commentary pairs - to ensure consistent, high quality content and rapid information search. Almost all consumer review sites are free. The one prominent exception is Angie’s List. Crowd sourcing high quality business related insights is a non-trivial problem. Professionals are busy and need a strong motivation to contribute. The so-called 1/9/90 rule posits that on a social media network or review site, only one percent of users will actively create content; another nine percent, the editors, will participate by commenting, rating or sharing the content; the other ninety percent watch, look and read without responding. We believe that it is necessary and desirable to motivate higher levels of active participation. We believe that content access coupled with the ability to build one’s reputation can be strong incentives for active participation. Access to a majority of content on our site will require earning or paying for access.